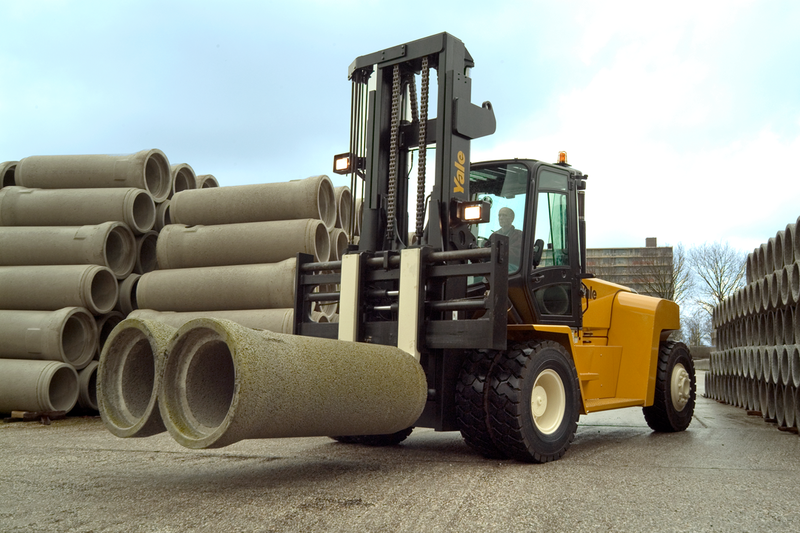 Yale high capacity forklifts for tough operations. Yale high capacity forklift trucks are designed to make easy work of the hardest loads in tough working conditions. With lifting capacities ranging from 19,000 up to 36,000 lbs, Yale® high capacity forklift trucks are suitable for all heavy duty applications, and come with a variety of options. The durable, low maintenance Tier 4I Cummins® QSB 4.5L Diesel engine is turbocharged and intercooled. This engine is world-renowned for durability, reliability, low life-cycle cost and ease of service. Keep up with the fast-moving pace of your job with the GP300-360EC Pneumatic Rider. Built strong to overcome the toughest challenges, this versatile and low maintenance truck is fitted with a 24-volt electrical system with an auxiliary 12-volt plug, allowing you to power through heavy duty applications. Its durability and reliability will keep chugging away at the hard tasks with only 500-hour service intervals, increasing your uptime and enhancing productivity. The durable, low maintenance Cummins® QSB 6.7L Diesel engine is turbocharged, intercooled and Tier 4i compliant. This engine is world-renowned for durability, reliability, low life-cycle cost and ease of service. The Yale ERGOCAB™ sets new standards for visibility and comfort for both open and enclosed compartments.